Cut off shoot tips 10 to 15 centimetres in length, remove the lower leaves and place in a rooting medium. Satisfactory rooting media include coarse sand, perlite, vermiculite or a mixture of these. Mixtures such as 1/2 sand + 1/2 perlite, 1/2 perlite + 1/2 peat, or 1/2 sand + 1/2 peat work very well. We prefer a peat free mix though! Select a container 7 to 10 centimetres deep for rooting the cuttings. Fill the container with the moist medium (not overly wet), then insert the cuttings to a depth of 3 to 5 centimetres. Firm the medium around the cuttings. Do not use a rooting hormone and do not cover. Also, avoid crowding the cuttings so there will be some air movement to help prevent disease. 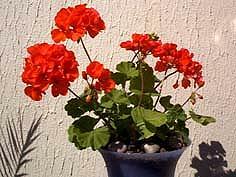 Then place the plants in a warm location that receives bright, but indirect sunlight. Check the rooting medium for moisture every week. It usually stays fairly moist for several weeks before additional water is needed. Plant the cuttings into small individual containers filled with a coarse, well-drained soil mix, when new roots are about 2 to 3 centimetres long. Pot at the same depth as the cuttings were placed in the rooting medium. Gradually move the plants into more direct light. Be very careful to over winter them in a frost free and dry area as 'damping off' is particularly problematic.